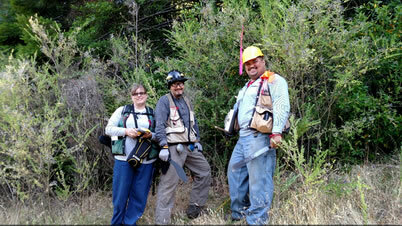 Field sampling on the Yurok Reservation, encroached by trees and shrubs. Shaonna Chase (left) Yurok Tribe GIS specialist, Frank K. Lake (center) Forest Service research ecologist, and Eldon Kinney (right) Humboldt State University student researcher. Joe Hostler, Yurok Tribe Environmental Program. Snapshot : Open prairie grass and oak-dominated woodlands provide numerous cultural resources to the Yurok Tribe. Since the 1940s, more than 80 percent of historical prairies have transitioned into forest, resulting in significant increases in fuels and vegetation contributing to the loss of open grassland and woodland habitat of cultural significance. How has fire exclusion and forest management resulted in a transition from prairies to more forested landscapes of the Yurok Reservation? Research Location : Yurok Reservation, Humboldt County, Calif.
Federal fire suppression and forest management on the Yurok Reservation has resulted in the change from former frequent tribal burning to fire exclusion practices that have increased the landscape fuel loads and densification of forests. The current degraded condition of tree- and shrub-encroached prairies has resulted in a significant loss of tribally valued cultural resources, such as traditional foods, basketry materials and open grassland wildlife habitat. Yurok villages historically burned areas to promote and maintain prairies and oak-dominated habitats. The Forest Service’s Pacific Southwest Research Station collaborated with the Yurok tribe and Humboldt State University’s Rroulou’sik National Science Foundation Research Experience Undergraduate Program to lend expertise to Eldon Kinney, a Yurok tribal member and Humboldt student. Kinney sampled vegetation diversity and soils along a gradient of historical forest to where forests began encroaching onto modern prairie boundaries. The research supports the Yurok tribe’s effort to use GIS and field-based sampling to quantify the change or loss of former prairie habitat. The Yurok tribe will use this research for a climate vulnerability assessment to supports forest restoration planning and re-introduction of cultural burning to promote desired landscape conditions.